However, you can better understand the all three terms by looking at the box diagram given above. Look at the box sides carefully and start with one corner. I would recommend you to look at the bottom right corner and name the all three sides as per the logic. The length is the horizontal line when seen through the front of the box. The height will be the vertical again at the front of the box. And width is the following line that goes from front to back across the two pints of the box. To find the volume of a box, we expect that you have named the sides as discussed and the volume would be – side * side * side. In most of the cases, the box is an enclosed figure either a rectangle or a square. 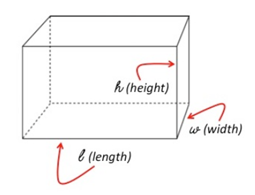 Here, we will discuss some interesting facts about the box and how to calculate the volume and the surface area of a box with the help of mathematical formula. The box is always characterized through three dimensions. These are the height, width, and the length. They can be either different or same based on the structure of the same. If all three sides are equal then the volume is given as – side*side*side. In case, all three sides are different then the volume will be calculated as V = h × W × L.
The perimeter is generally defined as the area around its edges. Once you want to calculate the perimeter of a shape then you just need to add up the side lengths and calculate the final output in minutes. You should start with the basics always and concentrate on critical learning in schools and colleges. If you will understand the basics first then it cannot be applied to complex real-life problems later. So, a depth understanding of basics and formulas will always give a right start for higher education. The square having two diagonals and they are equal to each other. With the help of diagonal formula, you can always calculate the diagonal length quickly. Simply, diagonals are the line joining two non-adjacent vertices of a polygon but it will exclude the edges of a figure. Also, the career of a student will also go ahead with cumulative mathematical education. When simple facts are combined with theory, it will deliver you the sophisticated mathematical knowledge.